This entry was posted in Other Whisky News, Whisky Tastings and Events News and tagged Dufftown, festival, Tasting, the whisky shop dufftown, Whisky on 20 October 2010 by Mike. During the Autumn Speyside Whisky Festival I ran a tasting looking at some of the perceived wisdom about whisky drinking. HereÃ¢â‚¬â„¢s what happened. For this test we matched a wide mouthed tumbler against a copita (a sherry tasting glass). From both glasses a sample of MackillopÃ¢â‚¬â„¢s Choice Imperial 1990 was nosed and tasted. The results were outstanding. The Imperial is from a single bourbon cask and is all bananas and tropical fruits interlaced with vanilla. This nose was only too evident from the copita but it was almost impossible to get anything from the tumbler. This is the perceived wisdom but the extreme difference was a surprise. Now to tasting. The perceived wisdom is that that the copita shoots the liquid in to the centre of the tongue and makes it difficult to taste whisky where as the tumbler spreads the liquid across your tongue making it more accessible. This one was a difficult one to test as almost everyone in the room naturally worked the whisky from the copita round their mouths. But the whisky tasted from the tumbler was again a lot less flavoursome. We found that the copita was much better for tasting the whisky. Had the large mouth of the tumbler caused the whisky to collapse releasing so many of both its aromas and flavours? This is the only answer we could come up with. So the answer is yes. To enjoy both the full aroma and flavours of a whisky then use a glass with a narrow opening (and preferably only at one end). For years now I have stood at the front of tastings saying that whisky is better diluted with a low mineral content water. But is this true? For this experiment we sampled Glenmorangie Original neat, with low mineral content water (Glenlivet) and with a high mineral content water (Strathmore). The choice of Glenmorangie was deliberate as this is made with process water that is relatively high in mineral content and some say you should dilute whisky with water of the same mineral content as was used to make the whisky. Nosing and tasting the Glenmorangie neat proved to be a good decision. This fixed in peopleÃ¢â‚¬â„¢s mind the origin of the aromas and taste of the whisky. By adding a small amount of water more could be got from both the nose and the taste when adding the low mineral content water. You could see the genesis from the undiluted to the diluted Ã¢â‚¬â€œ you got more out of it. The Strathmore and the Glenmorangie had an unsettling impact. It changed the taste of the whisky adding bitter notes and taking away a good deal of what could be found in the undiluted whisky. This was not a good combination. As a further test we went back and tried the same experiment with the MackillopÃ¢â‚¬â„¢s Choice Imperial. If anything this was an even bigger disaster for the Strathmore and Imperial completely stripping away many of the notes from the Imperial leaving something a bit bitter and salty. So water does matter? If you are going to dilute your whisky try to use low mineral content water even with whisky made with high mineral content (hard) water. This experiment looked at what actually is the effect of adding spirit caramel to whisky other than making it darker. For this I chose Benromach 10 Years Old. This is a fabulous all round whisky being a combination of sherry cask and bourbon cask whisky married together and then re-racked into sherry cask for an extra period of maturation. It has a distinct and significant smokiness coming through from the Speyside peat that was used to dry the barley. Again we all nosed and tasted the Benromach 10 as Gordon & MacPhail intended. Each of us then added a touch of spirit caramel Ã¢â‚¬â€œ just enough to coat the tip of the end of the handle of a tea spoon. The colour change was as dramatic as the change to the nose and palate. It killed it. There was a vast reduction in the range of aromas and flavours after the caramel was added. Some peaty smokiness was there but nowhere near as much as before. While there was some difference in opinion about whether people preferred the original or the coloured version everyone had agreed that it had significantly changed the whisky. For the record most preferred the un-coloured version. I have tried this with a number of whiskies now and the results have always been dramatic. It definitely splits people as to which they prefer, coloured or uncoloured Ã¢â‚¬â€œ the colouring does tend to have a rounding effect knocking out any of the flavour / aroma spikes. In our experiment, even knowing what had been done, most people admitted that the darker coloured whisky looked more appealing. So colouring does have an impact but it depends on you and the particular whisky whether this is a good or bad thing. My theory is that the caramel adds oil to the whisky which makes it difficult for you to nose and taste the whisky. The oil traps the flavour molecules and interferes with you tasting them Ã¢â‚¬â€œ the opposite of molecular discombobulation possibly. And Gordon & MacPhail, well done for not colouring Benromach 10 Ã¢â‚¬â€œ good job! ItÃ¢â‚¬â„¢s next to impossible to get a sample of exactly the same whisky chill filtered and non-chill filtered. So this experiment required some home improvisation. Method: Take one sample of whisky. If cask strength then cut to 40% ABV. Split the sample in to two. Chill one portion overnight in a very cold fridge. Next morning pour it through a funnel lined with a coffee filter paper and collect. You now have one chill filtered sample and one that is not. We used 2 whiskies for this experiment: my own cask strength Exclusive Mortlach from a re-fill sherry cask; and a cask strength Imperial from Duncan Taylor (ex-Bourbon). Part of the reason for using my Mortlach was to try and see if the thick haze that is created with the addition of water could be filtered out (only partially at best as it turned out) and the Duncan Taylor sample as their overseas sales director, Mark Watt, is fond of saying that chill filtering rips the heart out of whisky. I cannot in any way claim this is an accurate representation of chill filtering as done by distilleries but itÃ¢â‚¬â„¢s the best I could come up with. The lack of reduction in the haze of the WSD Mortlach suggests to me that the process I undertook is quite possible filtering the whisky less than in is done in the industry. You will be surprised how long it takes to filter whisky. Again the results were stark. The WSD Mortlach became in both nose and taste lighter, less oily but also with less depth and there was a distinct cardboard flavour. Not good. The Imperial, well it had had its heart ripped out (but no cardboard flavour so this had not come from the filtering). We used 2 very different whiskies and all preferred the un-chill filtered version. So the conclusion is buy a non chill filtered whisky if you can. Of course chill filtering could remove a nasty heart from some whiskies! The real heathen crime or so the perceived whisky wisdom is to add ice to whisky. The idea to test this came about when I was drinking whisky in a very hot flat in London. Frankly the Arran 10 I was sampling had the temperature of bath water. I decided to add ice and from this I decided to go public with my findings. At the tasting we had samples of Arran 10 and Lagavulin 16 in Glencairn glasses. Starting with the Arran we nosed and tasted the whisky before adding ice and then we did the same with the Lagavulin. I encouraged everyone to nose and taste as soon as the ice had gone in so we could see the effect of cooling the whisky as opposed to diluting it. I used ice cubes made from Glenlivet Spring water. Both whiskies became thicker and oilier with the ice. With the Arran a much stronger aniseed note appeared and it was less malty than without the ice. The ice had changed the flavour but definitely not destroyed it. Different flavours were coming through. You could tell it was Arran 10 but it was different on the nose and palate. If anything the adding ice had generally reduced the nose of the whisky. Ice made the Lagavulin bolder. It becomes more strident. The peatiness took on a heavier, drier, much ashier characteristic. The change here was quite remarkable. The conclusion is adding ice to whisky is not such a bad thing. In certainly changes it and it may for some whiskies even improve them. And to avoid drinking whisky which is like bath water, those people living in warmer climes than the North East of Scotland, please keep adding ice to your whisky! 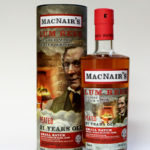 This entry was posted in Other Whisky News and tagged Denmark, France, germany, Holland, Netherlands, Shipping, Single Malt, UK, Whisky on 10 November 2009 by Mike. For the winter we have reduced our UK shipping rates for single malt whisky and our other products to £9.50 for two bottles and above. So whether you buy 2 bottles or 12 bottles (one for each day of Christmas) then you only pay £9.50 in shipping for UK delivered orders. The £8.50 charge remains the same for the first bottle. We have also reduced are shipping rates for France, Germany, Netherlands and Denmark for the winter. For any purchase of 2 or more bottles of single malt or any of are other products the shipping rate is a flat fee of £18.00. This entry was posted in New Whisky Releases and Bottlings and tagged AD Rattray, Benrinnes, Glen Elgin, Highand Park, Single Malt, Whisky on 2 November 2009 by Mike. This whisky is a first fill from a Sherry Hogshead and is at 57%. It's full on sherry with lots of syrup. If you ever wanted to know wanted to know what a chocolate fruit cake is like then this it. An exceptional Highland Park particularly if you like them a bit more peaty than the average. The Bourbon cask supports a tary smokiness coming through with creamy. Smoked custard! A really smooth 24 years old with the wood not dominant. Still fresh and buttery. Has a quality like an oaked Chardonnay. Great.